Beginning with footwear, this year is all about chic, edgy flats. Vogue’s recent photo-story starred Valentino’s embellished emerald espadrilles. For something a little more wearable and without the luxury price tag, Castell’s classic espadrilles in lavender, or Maï’s ethically responsible and effortlessly cool 4 Terra sneakers make a discerning alternative. Last season’s staple, the skirt, has been updated for summer with the simple addition of a split. Altuzarra took theirs thigh high for maximum impact, but for those wishing to show a little less skin opt for Maisha Concept’s wrap skirt, with added geometric tribal detailing on the waistband. After a triumphant return to form last summer, crop tops are back again this season, making an appearance all over the catwalks. Some of the best of the season came from Jill Stuart, whose sports-luxe appeal resonates here in both Yes I’m French’s long-sleeved quilted black crop and two-tone sky-blue and mesh offering. Spacious, versatile, and chic, the drawstring bucket bag is an elegant and covetable carryall. 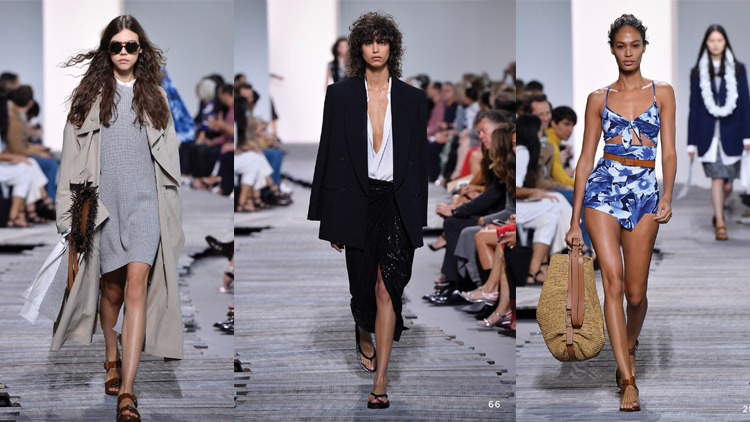 A huge number of the major players such as Christian Dior, sent these bags down the runway last fall in jewel-colours and exotic skins. To pack a similar style punch without breaking the bank, check out Mischa’s hunter-green drawstring or Artessorio’s perforated black leather bucket. And finally, the on-trend accessory this season is cuffs. Alexander McQueen’s models owned the runway with their Athenian adornments. At Shop des Créateurs, Camille Enrico takes the warrior stance one step further, adding tribal appliqué to hers, whilst niin Jewellery’s offers a more elegant earthy feel with its semi-precious stones. This season’s first trend begins with neon footwear. For Spring/Summer 2014 neon is the best way to add flair to an outfit and fun to the feet, such as these fluro sneakers from Barons Papillom. Floral and big, bold, graphic prints were seen everywhere in the Spring/Sumer 2014 collections, but no one did it better than Dries Van Noten whose mismatched, folky florals were dark, brooding and achingly cool all at the same time. Taiwanese based Boom Boom Kidz have got it spot on with their Dinosaur Tango hooded jacket, or for a more understated graphic, check out Mischief’s print bomber. Accessories-wise, it’s all in the bag. The man bag exists in many forms, from rucksack to hold-all to tote but there’s only one that has the ability to make or break an outfit - the man-clutch. 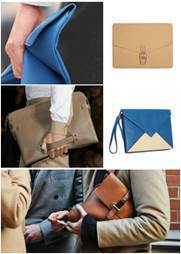 If lust pursues items from Burberry Prorsum, Valentino and Bottega Veneta but budgets can’t quite keep up, try Fabrix’s mustard colour folder case for your neutral needs, or if feeling a little more brave, Carokhoto’s electric blue iPad case is one to covet. This month also marks a new addition to the site – For Him and For Her gift boxes, featuring a carefully curated selection of the most wanted items from key independent labels. 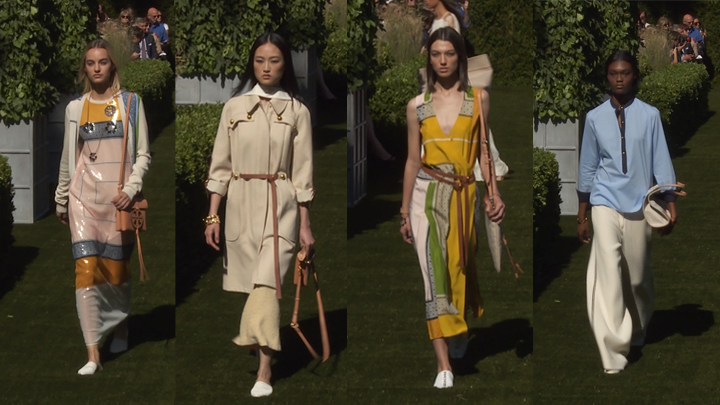 Priced at just $1,000 - $1,200, the sets are tailored to the fashion enthusiast on-the-go, housing essential items from selected brands, including a chic, quirky watch from Toronto’s May 28th, a delicate brass bracelet with semi-precious stones from Le Sursaut for the ladies, and more. Featured brands include Hong Kong’s Made in Eden, Stockholm’s Dienastie, and Toronto’s May 28th. Featured brands include Hong Kong’s Mischa and Fashionary, Le Sursaut from Paris, and Toronto’s May 28th. Gathering the best independent designers and fashion bloggers from around the globe, Shop des Créateurs welcomes new and exciting brands every month. For April, Parka London, with its subtly quirky, modern take on the parka, and Lubochka, specialists in creative colour blocked handbags, are two among many others joining the family. Shop des Créateurs is the authoritative source for independent and genuinely creative-fashion online.